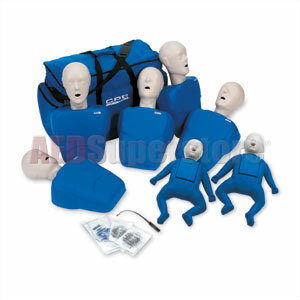 5 Adult/Child manikins and 2 Infant manikins packed in a durable nylon carrying case with 50 Adult/Child & 20 Infant face-shield/lung bags and insertion tool. Not made with natural rubber latex. 18 lbs. Five-year warranty. I called several companies looking for these manikins. I eve n called the manufacturer and all stated they were out of stock (even manufacturer)!!! The item would be assembled in 3 weeks. No to mention once it ships to the suppliers then i'd get my manikins. I finally called AED Superstore, i really had to ask several times to make sure i was hearing "Yes we have it in stock. Well, 5 business days later i had my manikins. This is a true story i am not getting paid to say this and will look first to AED Superstore for my CPR instructor needs. The service was great. The kicker was the price!!! service!! !